The wait for Rick and Morty season 3 is almost over. It was announced a couple of weeks ago by creators Dan Harmon and Justin Roiland that the long-awaited third season of Rick and Morty is finally going to arrive on July 30. But what to do until then? Well, you can start by watching these excellent Rick and Morty claymation videos that parody classic sci-fi and horror movies. Adult Swim has been just as eager to get some new Rick and Morty episodes as anyone, since it is easily one of their biggest hits currently. To help fill the void until the new episodes arrive in a couple of weeks, the network has been releasing some very brief but very awesome Rick and Morty non-canonical adventures, which feature the duo taking on some of the greatest sci-fi and horror movies ever made. So far Rick and Morty have tackled 2001: A Space Odyssey, Re-Animator, Aliens, Blade Runner and, just for a little straight-up horror flavor, Poltergeist made it into the mix. 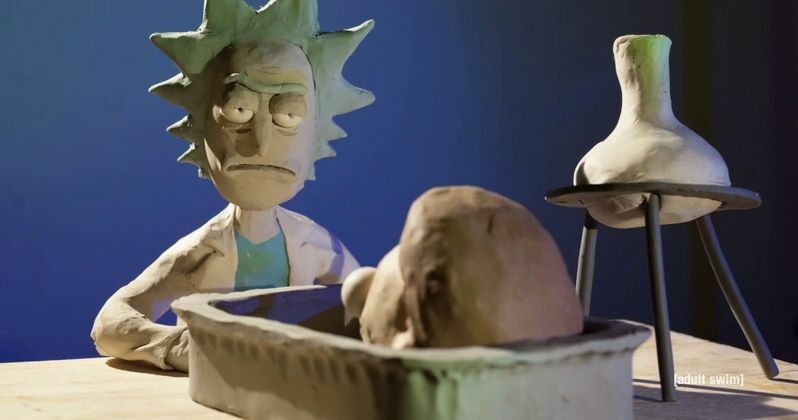 Even if you aren't familiar with all of these movies, just seeing Rick and Morty in claymation form is pretty worth your time. The Blade Runner video recreates the classic scene between Leon and Deckard, with Rick playing Leon and Morty playing Deckard. Yes, there is a sweet claymation eye-gouge. The Poltergeist video has Rick playing Robbie and is a take on the classic creepy clown scene. It works better here than it did in the 2015 remake. Their Re-Animator bit appropriately features Rick as Herbert West, who has beheaded Morty's Dr. Carl Hill. A very classic scene retold pretty damn faithfully. The 2001 video, as one might expect, is the iconic "open the pod bay doors" scene. As for Aliens, the video serves as a very brief retelling of the climax, in which Ripley (Rick) takes on the Xenomorph Queen in the Power Loader to save Morty, who plays Newt. Jerry also shows up in the best way. Interestingly enough, this is not the first Alien adventure Rick and Morty have been on. There was a fully-animated promo that featured the pair coming across a facehugger around the time that Alien: Covenant was rolling out in theaters. These may be non-canonical, but this is a crossover that really needs to happen. Rick and Morty season 3 is going to consist of 10 episodes, including the already released premiere, which will start airing on July 30. At the moment, it is unclear if the return date will be a re-airing of the season 3 premiere, or if they are going to be showing another new episode as well. We'll know soon enough. For now, you can check out the Rick and Morty claymation videos for yourself below to help tide you over until the new season finally arrives. Just get schwifty and hang in there a little bit longer.